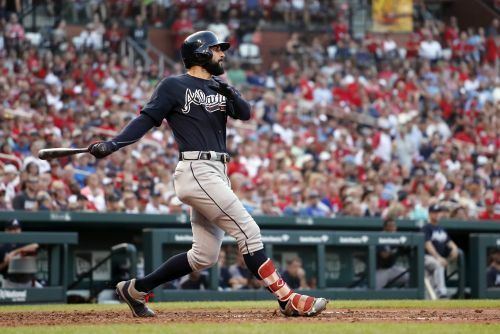 ATLANTA (AP) — Nick Markakis kept saying he'd rather have a four-day break with his family than be named an All-Star. Actually receiving his first All-Star selection changed all that. Suddenly he realized he'll relish the time with his wife and three sons at a setting where he'll be recognized as one of the game's biggest stars. "Yeah, it's one of those feelings that you've never felt before," Markakis said. "It's definitely special, especially with my kids being old enough to be able to share it and remember it." "It's going to be exciting," Markakis said. "It's going to be a fun couple of days up there. I'm excited to share it with my kids and share it with my teammates who are coming along with me." "One of the happiest moments of my big league career was giving him that All-Star envelope," Braves manager Brian Snitker said. "I can't imagine anyone having a more All-Star worthy season than Nick Markakis," Showalter said when the Orioles visited Atlanta in late June. "There is such a self-pride there. Contracts don't drive him. The only thing that drives him is winning." "To try to put a young team together, to have a guy like Nick around is paramount," Showalter said. "I've got myself in a routine I do daily," he said. "I try to stay within that and not stray too far from it. Even when I was young I watched the older guys and how they prepared themselves with what they did. It rubbed off on me and now here I am today doing it and hopefully I can help my teammates and the younger guys." "I'm learning from them and hopefully they can learn from me, too," he said. "Just go about your business and do what you can to help a ballclub win every day." Markakis has helped the Braves lead the NL East for much of the season. He entered Friday night's game against Arizona leading the NL with 116 hits and 38 multi-hit games and tied for the lead with 29 doubles. His .322 batting average ranked second in the league. Markakis is having his best season, but he has been good for many years. He has a .289 career batting average, though his modest power numbers made it difficult for him to fare well in comparisons with the game's top sluggers. Markakis has hit 20 or more homers in only two seasons, the last time in 2008 when he hit 20 with Baltimore. He has 10 homers with 60 RBIs. "I love the guy," Toronto manager John Gibbons said. "I saw him many years in Baltimore. I don't think he probably gets the recognition he deserves. .... He's still one of the top pure hitters in the game." Long-suffering Padres fans can't wait to see Tatis Jr.
Yankees Update: What's the deal with Sonny Gray?